They are the army’s ride and joy. We’ll remember best Corporal Rusty and Private Rin Tin Tin. 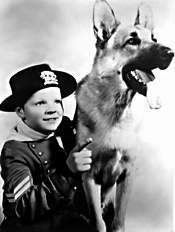 A wonderful kids show, Rin Tin Tin caused every child to pester their folks to get them a German Shepard dog. Rusty and Rin Tin Tin were the only survivors of an Indian raid on a wagon train. They were adopted by the 101st Cavalry at Fort Apache in Arizona territory. The original dog was a veteran of the German Army during WWI. 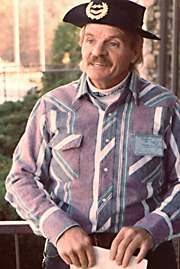 But all three of the German Shepards used on the show were trained by the great Lee Duncan. Did you know that this was filmed in the refurbished set of John Ford’s movie Fort Apache? 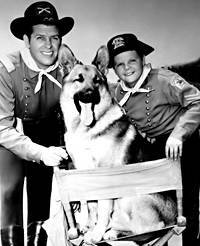 TV Guide’s Rin Tin Tin Page, with TV Listings, Photos, Videos, Exclusive News and More.